How cute! I love them! When I was a kid (and actually, I still have it) I had a National Geographic book called about farm animal babies (it was a series: zoo babies, farm babies, etc). It was filled with beautiful photographs. My favorites were the sheep and the ducks. This picture reminds me of that. Beautiful! After looooving your choc biscotti (as do the coworkers), I'm wondering if you can recommend any good almond-scented biscotti, perhaps with choc chips? So glad you're enjoying these photos. That farm animal babies book sounds wonderful. It's neat that you still have it. Oh, they are very huggable indeed. VERY huggable. Soooo soft. Great to hear of another baker's chocolate biscotti success. You definitely have some lucky coworkers. Hmmmm. Almond biscotti with chocolate chips? That sounds really good. And it's been quite a while since I've put up a sweet recipe (enough with these obnoxiously healthy vegetables, already : ). Maybe I can come up with a new biscotti recipe. Thanks for the inspiration. If only human babies could stand on their own feet so quickly - I would have had several dozen by now if that was the case. I'm with Jamie! Hugging a lambie would be plain heaven today. Virtual hug! That's truely a beautiful picture!!! Oh my gosh, it's a regular nursery school over at the Farm!!! How cute are they all??? You are such a good nanny, Susan. So cute! Everywhere here in Oregon the little lambs are resting in the pastures. I love it. 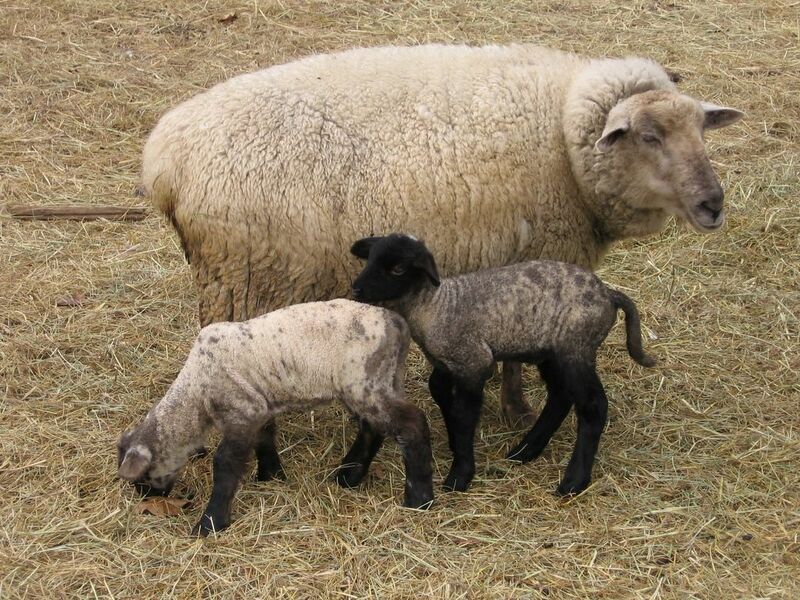 I am feeling more at home every moment, as I see these wonderful pictures of proud moms with their lambs. This is the one thing I miss about New Zealand, the sight of hills dotted with newborn lambs and their mothers, in spring. I've had you in my favorites for some time, and have just recently started checking on you daily. I grew up on a farm in middle Tennessee and your pictures remind me of home. I want to come visit so I can hug all the baby lambs! I am going to pass out from all the cuteness...my brain is going to explode. That is so sweet. You are very lucky to have that kind of thing going on in your own "backyard"
Ok - no more bacon here! Precious! Guess we need to consider farm living - it's looking pretty good at the moment. I have never seen a lamb in my whole (long) life! Think it is time to go find one to touch. And, maybe I can see some piglets while I am searching. Being as these 2 are so wooly, and there's a pair of them- what about "Nit" and "Pearl"? The naming of twins is a whole new ballgame. My daughter went to school with a pair of twins (boy and girl), named "Diana" and "Ross". Awwwwww. I can't wait to show this to Logie-O. They are very huggable--once you catch them! Welcome to the comments section of the farm! I'm so happy you decided to say hello. I'm glad you're enjoying daily visits, and I hope I'll hear from you again. You can't pass out now. We're just starting! Little lambs are very, very soft. And little piglets are adorable, especially when they are roaming around in a large pack. Click here if you'd like to see a piglet action shot I took at the livestock auction one night. Oh my. I'm not sure what to say about your newfound talent for naming sheep. "Nit" and "Pearl" have rendered me speechless. Which is probably good because I don't think I should say anything about those poor twins, "Diana" and "Ross." I once knew two brothers named "Jan" and "Dean" (apparently their mother was a huge fan), but they weren't twins. LOL, M wasn't the only one who thought of lamb daube after seeing these photos. Click here to find out who else did (and for his delicious sounding recipe).